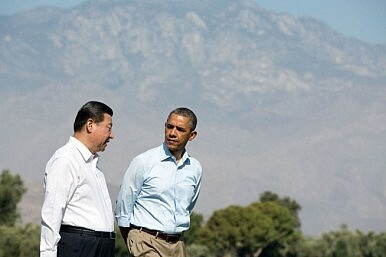 Beijing and Washington cannot afford to let strategic misjudgments continue to pile up during the rest of Obama’s term. President Obama will head to Beijing in the coming days to attend the annual APEC summit on November 10 and 11. But perhaps the more important event on his agenda is the whole day meeting with Chinese President Xi Jinping on November 12. Compared to Obama’s first state visit to China in 2009, and the two leaders’ meeting in Sunnylands, California last year, both of which drew the world’s media focus, this meeting has not accumulated the same hype. The importance of this year’s summit has been diminished in the light of President Obama’s weakened domestic political leverage. President Obama left Washington with the bad news that his Democratic Party had lost control of the U.S. Senate to the Republicans in the mid-term elections. With the result of the elections and the lower approval rating for his policies, it has become apparent that Mr. Obama is a lame duck president going into his final two years in office. Next year will bring the start of the 2016 presidential election cycle, and the current presidency will become even less of a focus. There is a sharp contrast between President Obama and his Chinese contemporary when it comes to domestic politics. Mr. Xi continues to accumulate more power and influence within China as he uses his anti-corruption campaign as a tool to further strengthen his power base. Additionally, Mr. Xi is conducting major reforms with the ambitious plan to further change China and his party. For both President Obama and President Xi, the upcoming meeting on November 12 will be mainly focused on the immediate future, with the hopes of creating a mechanism to set the tone for smoother relations between the U.S. and China while Obama finishes his term in office. Furthermore, what also makes this meeting less important than those prior is that after six years in power, the Obama administration still has not found its China strategy. Inside the United States and even inside the administration itself, there are very different opinions being debated about the policy towards Beijing. The “pivot to Asia,” Obama’s signature policy on the Asia-Pacific region, never really took hold, and has yet to provide any sort of effective impact. This policy’s content has never been made clear, and as such it has caused much suspicion and varied interpretations in the region. One of the profound problems for the Obama administration’s China policy is that several key positions on Obama’s China team, including the senior positions in the White House, the State Department, and the Pentagon, are currently being held by “young people” who don’t have long-term experience in dealing with China policy or even working within the government. In the past these positions have been held very senior political analysts and China experts, but in the second term of the Obama administration, many of these individuals left government service. Their successors are comprised of individuals with much less government experience, many of whom are not even China experts. This is an unparalleled occurrence since the two governments established diplomatic relations 35 years ago. Until recently, the U.S. had a tradition of having its best China experts handle this important relationship. In the past six years, U.S.-China relations have become unstable, and there is strong mutual strategic suspicion and mistrust between the two states. There is now a rising concern that the mutual mistrust will develop into mutual strategic misjudgments and mistakes. China’s foreign policy and the Xi administration have caused major concerns inside the United States. For example, China’s behavior in the South China Sea in recent months, including the deployment of oil rig HYSY 981 within Vietnam’s exclusive economic zone, has been interpreted as a change in Beijing’s foreign policy, and has some comparing it to Russia’s behavior in Ukraine. However, I just returned from Beijing and one of the most senior policy analysts of the Chinese government told me that this is purely a misinterpretation. According to the analyst, China is simply reacting in a more assertive manner. He emphasized that China, far from being an aggressor, has only acted in response to other countries’ behaviors. He complained that China is a latecomer in terms of resource exploration in the South China Sea: that to this day, China doesn’t have a single oil or gas well in the Spratly Islands. China just started some oil and gas exploration in the area while other area nations such as Vietnam, Malaysia, and Indonesia have for some time been making huge profits from oil and gas development. Additionally, China only recently started to enlarge and build artificial islands where other states did so over ten years ago. This Chinese analyst believes China is just following suit — that its actions are nothing new, even though the Western media has been paying great attention to these issues as China gets involved. Therefore, he argued, China is just responding in a more active fashion, and in no way taking an expansionist approach in the South China Sea. On the other hand, within China, suspicion over U.S. intentions for the Asia rebalance has begun to develop into a belief that the U.S. is supporting China’s neighbors to create trouble for Beijing for the purpose of containing China. The Chinese military has been using this belief to ask for increased military expenses. Propaganda officials use this belief to argue that China needs more strict control over the press as well as social media to defend against U.S. cultural and ideological influence. All of this creates an atmosphere where it is increasingly critical to avoid further misjudgment, but the unfortunate reality of the U.S.-China relationship is that these two years may be wasted on account of Obama’s status as a lame duck president. It is extremely important for these two countries, and especially for Obama and Xi during their meeting, to communicate and find a way to avoid further increasing these strategic misjudgments over the course of the next two years. The two leaders must find a mechanism to salvage the remaining time of Obama’s administration to benefit both nations’ interests, and the world’s interests, as to not let the next two years become “garbage time.” The U.S.–China relationship has entered a very important junction and may not be able to wait another two years for new leadership to replace the Obama administration in Washington. Zheng Wang is the Director of the Center for Peace and Conflict Studies at Seton Hall University in New Jersey and a Global Fellow at the Woodrow Wilson International Center for Scholars.